If your child has a tickly cough, it is most likely the result of an allergic reaction to an airborne substance. A common symptom of allergies in children is throat irritation that feels like a tickle in the back of the throat. If the child develops nasal allergies, she may experience post nasal drip, which will also cause a tickly cough, according to the American Academy of Otolaryngology. A tickly cough in children should be assessed by a pediatrician for an accurate diagnosis and treatment options. 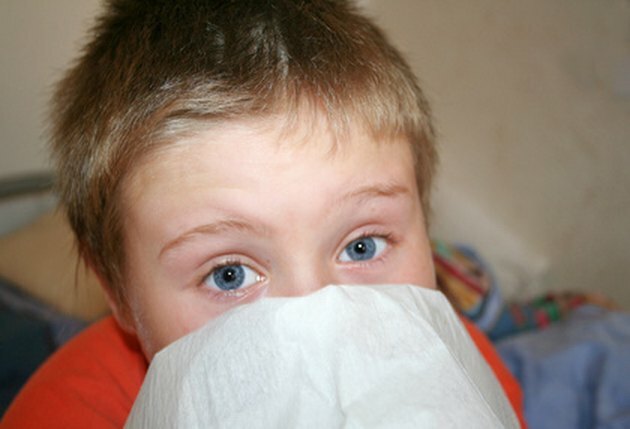 There are common symptoms that occur with an allergy-related tickly cough in children, according to DrPaul.com. The allergy cough will become worse when the child changes position, such as going from lying down to standing up. The allergy cough can increase if the child participates in physical activity or exercise. An allergy cough caused by nasal allergies will not show improvement with asthma medications because it is unrelated to asthma. Histamine is the hormone released that causes allergy symptoms. KidsHealth states that when your child has an allergic reaction, his immune system has an overreaction to a specific substance that leads to histamine being released. Histamine causes irritation in your child's body in different places. The most common places irritation will occur are in the eyes, nose and throat. Histamine can lead to a scratchy throat. This tickle can lead to coughing. Post nasal drip is a condition commonly caused by allergies where excessive mucus secretions drip down the back of the throat. The constant dripping in the throat can cause a tickling sensation, leading to a cough, according to the American Academy of Otolaryngology. Treat a tickly cough in children by addressing the cause. Keep your child away from allergens, especially during the springtime. Stay indoors and maintain a dust-free and mold-free house. Talk with your child's pediatrician about using over-the-counter antihistamines to alleviate the tickle in your child's throat. Cough suppressants may also be used to get the cough under control, if it turns into a chronic issue. Your child's doctor may recommend seeing an allergist to participate in allergy testing. Allergy testing will identify the exact allergens causing the allergy cough. Allergy shots may be recommended for your child, if her hypersensitivity is to an unavoidable allergen.